The thing most likely to lower your home contents insurance premiums is lowering the risk for the insurance company – and one of the things that most mitigates that risk is having home security. Home security technology has come a long way since the days of simply locking your front door and having a sign on the gate saying ‘beware of the dog’! With the recent development of smart homes and the ‘Internet of Things’, home security is in a booming phase. The minimum requirement for home contents insurance is that your house is a securely locked environment. This means that all windows and doors are locked in such a manner that they cannot be opened from the outside without a key. Remember that merely having the locks does not guarantee security – you also have to use them! Home insurance policies are not obliged to pay out if it’s discovered (by the police, or otherwise) that the house was not securely locked at the time of burglary. Make sure that if you go out, even if it’s just a quick ‘pop to the shops’, that your house is securely locked. This basic form of home security is simply an external wall-mounted light with a sensor that turns it on should any movement be detected near the house. Typically, they put off thieves, whose subtle approach is noticed, and trigger a belief that other security measures are in place. While external lighting will put off most opportunists, it does little else and its impact on premiums is limited. The most common type of house alarm is one which is independent of any external security system. Though these alarms are really nothing more than an improved version of the motion-sensing light, they are psychologically a far greater deterrent and very effective in warding off intruders. Having video surveillance of your home is a huge turnaround for potential thieves and visible cameras (even if they are not connected!) provide a strong level of deterrent. An upgrade of the independent house alarm is a linked alarm. It is connected (usually via a third party security company) to the police who will be informed of any break in to your home and respond accordingly. Additionally, a linked alarm system will provide all of the deterrents of a more standard house alarm. Consider purchasing a safe for your smaller valuables (jewellery etc.). Safes come in all shapes and sizes, and can be bought off the shelf or professionally fitted. A safe is a solid way to let your insurance company know you are serious about your home security. It may seem extreme, but if you have particularly valuable possessions, there are a number of highly secure physical barriers you can install in your home – either externally or internally. While shutters and grilles aren’t usually necessary for general home security, and can take away some of the relaxed ambience of your home, they exist for those who need them. While not an official home security system, it is worth mentioning to our advisors if you do have a reliable guard dog or other intimidating pet – it probably won’t get you a premium discount, but they might just know the right underwriter to talk to! It’s certainly a significant barrier between any would-be burglars and your prized possessions! Smart Home Security Systems (SHSSs) are the result of modern technology merging with the centuries’ old need for home security. 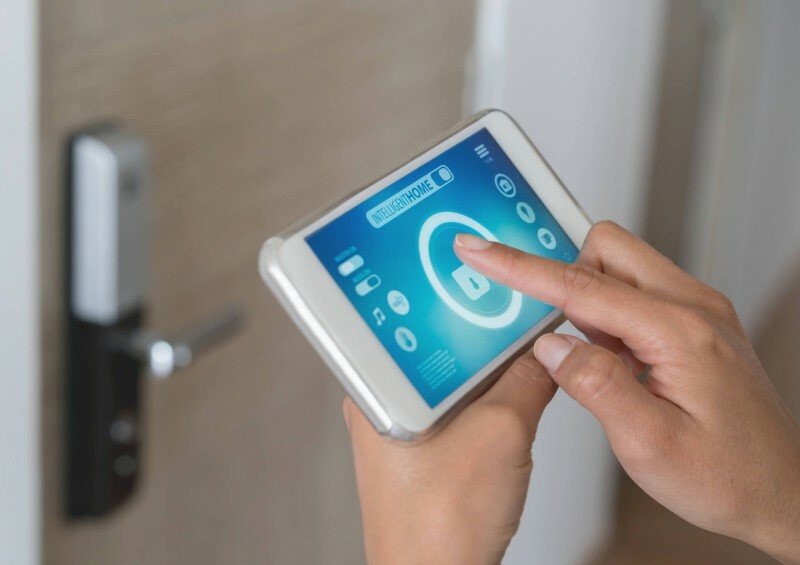 In essence, a smart home security system uses the house WiFi to connect (and control) all the relevant devices in your home to form a network of interwoven security. All SHSSs start with a set of sensors that are placed on doors and windows. These sensors can detect if the door or window is opened, and send that information back to the main control. Not limited to simply providing security while you are out of the house, they also provide data about your home use in general which can be used to get the best out of your central heating, for example – handy for saving a little extra on bills! An upgrade of the basic sensor, multiple cameras can cover sensitive areas of your home, coming online when movement occurs in their line of sight and sending video data back to the control station. Cameras can come with a number of additional modes, from inbuilt sound recording, through to night-vision modes and additional sensors. As well as providing a high level of security and solid video data regarding any break in, the high-tech camera can also serve as a baby monitor, providing peace of mind for parents with young children while they sleep. Integrating with other smart systems in the house, such as light or entertainment systems, the SHSS can fool potential intruders into believing the home is occupied, with a realistic fake day-and-night schedule. All SHSSs work with a centralised control – often a tablet or phone app. You are able to interact with and control your SHSS whether you are at home or away, with live video feeds streamed from your house directly to your phone. In addition to preventing robbery, should an incident occur, the data collected by your smart home security system will help police with detailed evidence against the criminals, significantly improving the chance of a conviction. Our advisors are able to discuss with you every aspect of your home security needs, whether that’s to evaluate your current situation with respect to your home contents insurance, or provide impartial advice as to the newest smart home security systems. Call us today for free expert advice!